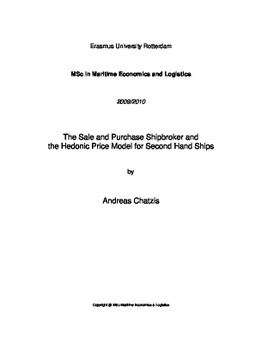 The main area of this thesis has to do with the shipbroking function and more specifically with the Sale & Purchase of ships. The role, the duties and the responsibilities together with the information network of the S & P broker are analyzed in the first part. In the following section the construction of an offer, the counter offers, the negotiations, the recap and finally the completion of the sale are analyzed extensively by presenting clause by clause the Memorandum of Agreement, the Bill of the sale and other important legal documents. Furthermore, this part is supported with a case study of real negotiations accompanied with the relevant MoA that concluded the deal. The aim of the dissertation is to give an insight on how brokers valuate a second hand ship. The research shows all variables that shipbrokers take into account in the determination of price for a second hand Panamax or Capesize bulk carrier and more specifically their relative weight in the valuation of a vessel’s purchase price. This empirical analysis is performed by developing a conceptual model that describes the S & P transaction microstructure after having examined S & P records of negotiation logs kept by brokers who initiated, supported and concluded the entire sales. These records together with questionnaires answered by Greek professional shipbrokers show all important factors that play a highly important or slightly significant role in the negotiations process and consequently in the determination of a ship’s sale price. Finally, the shadow prices of the most relevant determinants are estimated in a second-hand ship hedonic price model from an analysis of sale and purchase fixtures.